Ben Lawers (Gaelic: Beinn Labhair) is one of the highest mountains in the southern part of the Scottish Highlands. It lies to the north side of Loch Tay, and is the highest point of a long ridge that includes seven Munros. Ben Lawers was long thought to be over 4,000 feet (1,219.2 m) in height; accurate measurement in the 1870s showed it to be some 17 feet (5.2 m) short of this figure. In 1878, a group of twenty men spent a day building a large cairn in the hope of bringing the summit above the "magic" figure. The cairn is no longer there; in any case the Ordnance Survey ignored it as an artificial structure that was not truly part of the hill. Ben Lawers is not really in the Trossachs but it's a great climb and you get a head start from the carpark at 1400 ft.
From Stirling take the A84 via Callander, Strathyre and Lochearnhead then after Glen Ogle, turn right at Lix Toll through Killin to the north Loch Tay road. 3 or 4 miles east of Killin turn left onto the Ben Lawers road and up to the nature reserve car park. Throughout this walk you may see rare Alpine flowers in season. They are protected species and must not be damaged. The walk is carpeted with 'Alpine Lady's Mantle' and scented 'Wild Mountain Thyme' made famous by the song. left, through the game gate then ascend the shoulder and on up to the top of Bein Ghlas. Excellent views here to Ben Lawers with an Stuc and Meal Garbh hiding behind. 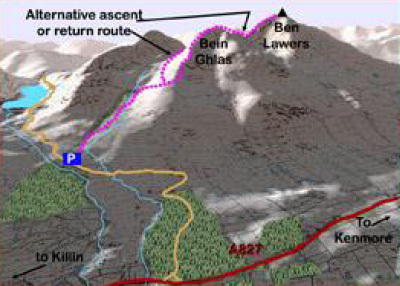 Continue north eastwards from Bein Ghlas and descend the ridge to the col at the foot of the final ascent to Ben Lawers. In poor visibility keep away from the steep cliffs to your right. The climb becomes steep and rocky, more scrambling than walking where eroded, for 600 feet to the Lawers summit. Beware steep slopes to the west at the top – it’s a long slide down and a longer climb back up! Views here over vast stretches of Scotland cannot fail to impress! by falling into the 'crater'. The crater often harbours snow well into summer. This last track to the north side from the beallach between Lawers and Bein Ghlas can provide a valuable escape route to lower levels if on the ascent the weather deteriorates unexpectedly. Descend to the car park by the track. Book Online & get up to 20% discount on your stay at Ben Lawers Hotel!